Over the long holiday weekend, I took a trip to the movies to catch I Am Legend, the latest in New York City destruction. While Will Smith, the only surviving human on the island of Manhattan, shuns what I imagine to be a deserted subway in exchange for his product-placed Ford cars, I couldn’t help but imagine the subway in an empty Manhattan. Devoid of people, there would be seats for everyone. Those would be the days. Of course, Hollywood is not afraid of the New York City subways. (And why should they be? Subway crime is at an all-time low.) So with a slow news week upon us — not much happens in the aftermath of a fare hike when many are off for the holidays — let’s go to the movies. Or at least let’s ride the subways to the movie. The movie is notable for taking place in actual subway tunnels and for a mention in a Beastie Boys song. The MTA allowed filming in the then-abandoned Court Street station and tunnels. Currently, that station houses the Transit Museum. The movie was remade poorly in 1998, but Tony Scott is looking to rectify that misstep with a new remake starring Denzel Washington as Walter Mathau and John Travolta as Robert Shaw. It’s set to open in July of 2009. Moving back in time, we come across The Incident, Martin Sheen’s movie debut. For this one, the New York Transit Authority outright denied permission to film. Two kids board a train late at night and begin to psychologically terrorize the passengers. Filmed in black and white, it’s a snapshot into another era when the subways were considered dangerous, and this movie, more than any others, has set the tone for the Hollywood portrayal of the New York City subways as a dark, lonely and dangerous place. Finally, we come to The French Connection. This one needs no introduction. It is simply the greatest train chase scene in movie history. See it. 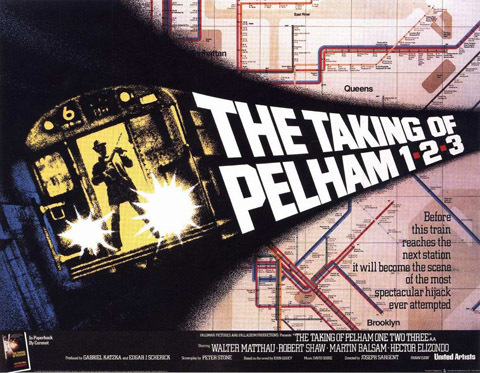 No movie captures the essence of the New York City subway better than the 1974 flick The Taking of Pelham One Two Three. The film stars Walter Malthau as the transit cop who must deal with Robert Shaw’s hijacking of a 6 train. The demands: One million dollars within an hour or the passengers get killed. Joseph Sargent’s film, adobted by Peter Stone from a John Godey book, is a work of New York City history. It’s gritty and campy. It taps into the fears during the 1970s that the subways weren’t safe and that New Yorkers just didn’t really care. And in a great piece of political satire, the movie features a bumbling mayor trying to run away from the city’s problems. In a word (or three): Watch this movie (but not that dreadful remake from the late 1990s). This movie is such a cult film among transit buffs that it has recently spurred this insanely long discussion on Subchat. Obviously, August of 2007 didn’t mark the debut of this film as a topic on the subway-centric message board. The threads have been too numerous to count, but this 2003 thread entitled the “Ultimate Guide to Pelham 1-2-3” is a classic. Now, Hollywood’s at it again. Director Tony Scott is going to remake The Taking of Pelham One Two Three with Academy Award winner Denzel Washington starring as Zachary “Z” Garber, the role originally played by Walter Mathau. No word yet on who will play the terrorists, but I would guess we’ll see some familiar Hollywood-style terrorists threatening the city with a hijacked subway. As you can see from this extensive thread on Subchat, feelings are running strong on this one. The original Pelham 1-2-3 drew some heat for taking some liberties with the way it presented the subway, and some contributors to the message board are urging Tony Scott to bring on some railfans as technical advisors. That’s sound advice; Scott shouldn’t distract New Yorkers, the film’s biggest target audience, with subway detail inaccuracies. Meanwhile, I’m a little skeptical of this remake. What makes the original work is it’s place in time. It is, as I said, the quintessential view of 1970s New York City. What would a 2000s New York City look like in a new version of Pelham 1-2-3? Would the automated voices apologize for the “unavoidable delay”? Would straphangers too zoned out on their iPods even blink? Would the hijackers be able to get inside and hijack an overcrowded train car on the East Side IRT these days anyway? Will the hijackers be your stereotypical set of Middle Eastern hijackers or would Tony Scott and his scribe David Koepp dare to be a little creative with their casting? For those of us who live and breath the subways — or at least try to breath inside the subways — Mr. Scott will have to prove his subway mettle. We can only wait and wonder if he’s up to this monumental task.